For Earth Day this year, I visited Hamlin School in San Francisco and discussed waste with students from Kindergarten to grade eight. Considering my audience, I wanted to keep things straightforward and to the point so I came up with a list of steps to reduce food waste at home. I figured most adults might find this information helpful also and so decided to post it here on my blog. 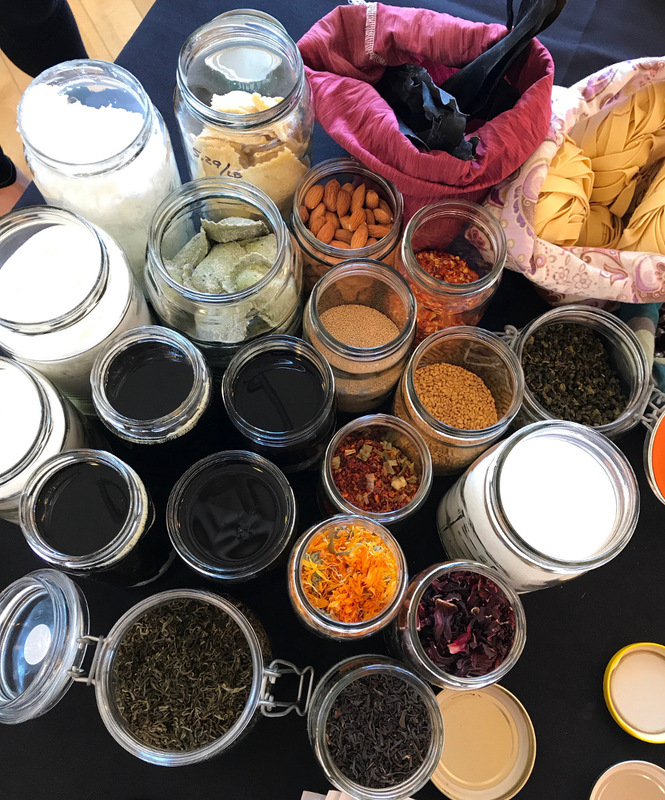 Before my daughter MK and I arrived at the school, we went shopping at our favorite store, Rainbow Grocery, and displayed our zero-waste shopping haul on our table for the kids, parents and teachers to check out. I don’t think they had ever seen anything like it. “What’s this?” most of them asked. The theme for the day was food waste. 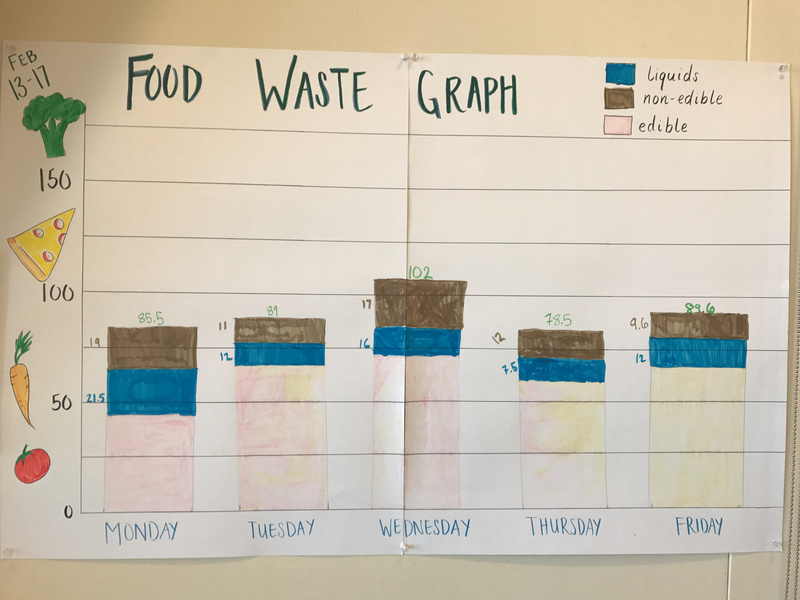 I spied on the wall of the cafeteria the chart pictured below, which the kids had made to track their food waste for a week. Tracking your waste is usually very eye-opening. Take stock of the contents in your refrigerator and pantry. You likely have enough food on hand to cook a meal or two. Cook these meals first. Make a list of missing ingredients for your meal plan. When you shop, stick to the list. Buy only what you need. If you have time to do this, the smaller amounts of perishable food you buy have less time to go bad. If you strictly follow recipes, you’ll end up with a pile of ingredients you bought just for those recipes. Instead, let your refrigerator and pantry dictate what you’ll cook. You can throw all sorts of vegetables into soup, stir-fry, frittata or quiche, for example. If you can see it, you’re less likely to waste it. Leftovers in plastic takeout containers often sit in the back of the refrigerator unnoticed until it’s too late. Fry leftover pasta and eggs in a pan, toss in chopped vegetables and sprinkle with cheese. Reincarnate chicken—make chicken pot pie. Turn bruised fruit into a quick bread or crumble. A head of cabbage will last a couple of weeks at most but when you transform it into kimchi, it will keep for a year at least. Such a lot of useful information here. Thank you. I changed to a smaller fridge about 6 months ago. I’m happy to report it was a great decision. Because it is smaller I am buying less food, and I can easily see all of the food in the fridge. We are definitely wasting less as we are more aware of what’s there. I am also shopping a bit more carefully – ie not stocking up at the farmer’s market unless I am really sure I will be cooking the food soon as otherwise I cannot store it. The new fridge doesn’t have a freezer, I ended up buying a separate, energy efficient freezer. So leftovers that don’t go in the fridge are frozen for another day and I’m batch cooking more. A smaller fridge and bigger freezer has definitely been a winner for us. Next plan for food is to build a small verandah at the southern end of the house to store the pumpkins, potatoes, hang garlic and onions etc we have grown (instead of in the laundry) and then close in one end of the verandah with a small storeroom for fruit, tomatoes etc we will bottle from the garden. We also hope to build a new chook run as food waste is virtually zero when you have chooks to feed. I find keeping track of what is in my freezer is also helpful in ensuring it gets used! I keep a running spreadsheet to help with this. Also key is labeling what I’ve put in the freezer!